Impromptu Game Day - Next Sunday, March 30th @ 2pm!! I will be having an impromptu Game Day - Next Sunday, March 30th @ 2pm!! All are welcome! I'm sorry about the short notice, but I just found out the final date yesterday. Sharon Pettigrew, a journalist for NPR, will be there on the 30th to interview me for a documentary that will air on The Canadian Broadcasting Corp as well as affiliated NPR stations. They have requested that I get as many people there that I can so they could also be interviewed for the documentary. 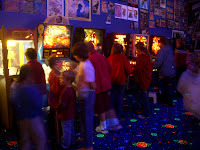 Here's your chance to be on the air and explain why you love the classic arcade machines! Please email me for directions if you are interested in attending! 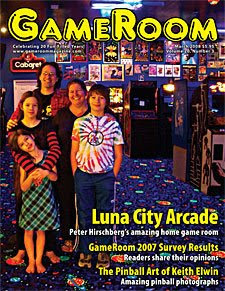 My family and I made the cover of the March 2008 issue of Gameroom Magazine. There's a nice interview with me, and another article written by Julie. And of course lots of photos of the gameroom.